We hope that you’re enjoying the extra sunshine and warmer weather as we approach the spring season! 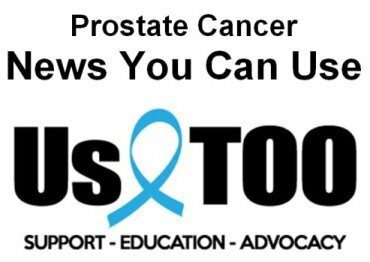 Listed below are titles of recent Prostate Cancer News You Can Use articles followed by a link to the Us TOO web page that provides access to the full text. The Metastatic Prostate Cancer Project takes a new approach to cancer research. Researchers partner directly with men with metastatic and/or advanced prostate cancer, who share their samples and clinical information in order to speed up important discoveries. The project is being launched and funded by the Broad Institute of MIT and Harvard — a non-profit academic research institution with a mission to dramatically accelerate the understanding and treatment of disease — and conducted in collaboration with Dana-Farber Cancer Institute and our advocacy partners. The project invites participation from men around the country with metastatic and/or advanced prostate cancer to study their cancer using cutting-edge genomic and molecular research studies performed at the Broad Institute. Learn more at: www.MPCproject.org. And join us on April 2 at 8:00 pm ET for The Metastatic Prostate Cancer Project FREE webinar in collaboration with Answer Cancer Foundation, The Broad Institute, and Dana-Farber Cancer Institute. Dr. Eliezer VanAllen, the project's Principal Investigator, will lead the presentation followed by Q&A. CLICK HERE for a digital flyer with details on the webinar agenda and instructions for joining. You may also be interested in downloading a new app for your mobile device. LivingWith is a free app designed to help manage life with cancer by connecting with loved ones, asking for help, improving communication with doctors, and staying organized - all in one place. CLICK HERE t o check it out. The April 2018 issue of the Us TOO Hot SHEET newsletter will be out in a few weeks. Take care and let us know how we can help you with educational resources, support services and personal connections to others in the prostate cancer community.